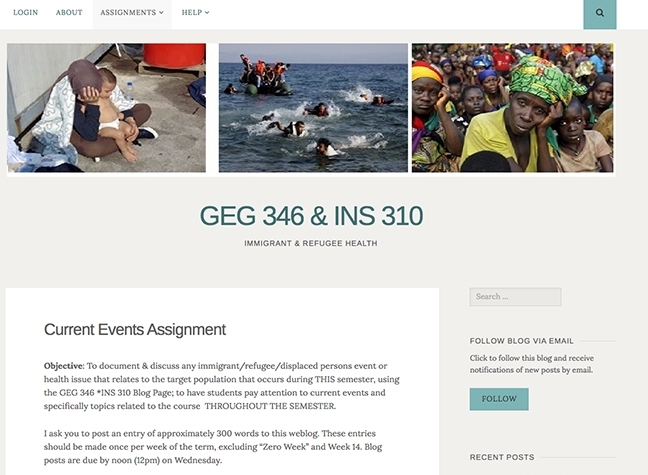 This faculty success story shares the use of a course blogging platform, within her undergraduate course, 'Immigrant & Refugee Health (GEG 346/INS 310), taught by Dr. Imelda Moise, Assistant Professor in Geography and Regional Studies. Leveraging WordPress.com as single course blog, students became authors and used the medium to actively analyse, sythesize and post on current events on immigrant or health issues. 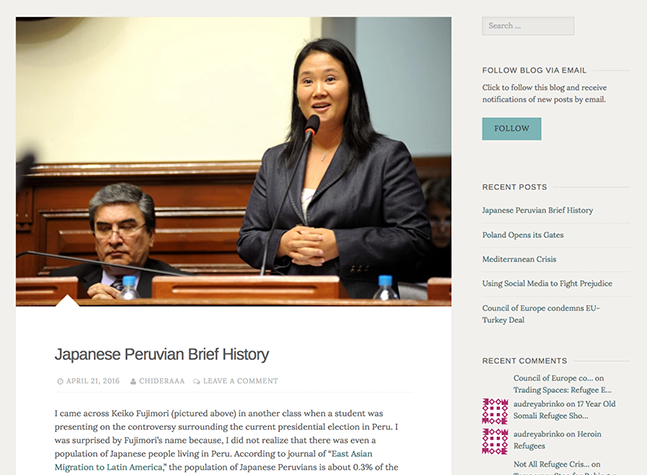 A course blogging platform provided the opportunity for students to critically reflect and foster discussion opportunities for in-class sessions. Dr. Moise's 'Immigrant & Refugee Health' course provided a theoretical background essential for understanding the complex interaction of migration and health. To contextualize theorectical approaches, in-class guest speakers and case studies were presented by different healthcare professionals working with migrant communities, addressing issues of immigrant and refugee health drawn for both national and international experience. A course blogging platform was selected as a learning space for students to apply theoretical approaches to relevant and timely events. Through a "Current Events Assignment" students were tasked to actively follow current events on any immigrant, refugee, or displaced persons event or health issue. Within the course blog, students were required to remediate, summarize and post a particular event, using multiple modes (text, imagery, video). Student contributions were then used to intitiate collaborative group discussions in class. Critical Thinking: Apply critical thinking skills in relation to international problems and strengthen analytical foundations as global citizens. Analyzing Information: Assess and compare health status/issues impacting immigrant and refugee groups reflected in the media. Effective Oral and Written Communication: Define, discuss and summarize informaton in a clear and concise approach to elicite further discussion. Technical Competency: Identify how to efficiently present a narrative using a digital medium. Guidance on the following implementation of these technologies was provided by Academic Technoloiges, however, technical support is provided via the third-party. Through the class blog and current events assignment, Dr. Imelda Moise expressed her desire to "engage students in knowing what’s happening around the world, make connections and bring current events back to the classroom environment." In particular, she aimed for her students to become engaged and empowered through current events, making connections with local issues in Miami in comparison to international migration events, to then share this with individuals outside the classroom. As one out of nine students had previously used a blogging platform, Dr. Moise expressed that the space was a new way for students to reflect on the relationship between relevant events and course materials, with the expectation it would lead a discussion within the class. Dr. Moise also confirmed, the use of a new space provided another reason for students to collaborate, through posting comments or crowdsourcing technical guidance from each other in how to navigate the space. The following steps detail how a reflective class blogging platform was initiated. Contact us to discuss your idea for the course and examine your existing syllabus and resources. Confirm with an instructional designer a blogging platform is the solution you need. Access WordPress.com. Create an account and select a concise and relevant blog name. Customize your course blog: Select a theme, add relevant menu items, and widgets (such as a Twitter Widget demonstrating selected topic tweets). Connect posts shared to in-class discussions and course materials.